Real PR was briefed by third-sector client, St Andrew’s First Aid, to help launch an expanded service dedicated to workplace first aid training in the Dundee, Perth and Tayside area. This was to be the first roll out of a city specific activity by St Andrew’s First Aid and called for a very focussed campaign idea. The solution was simple. 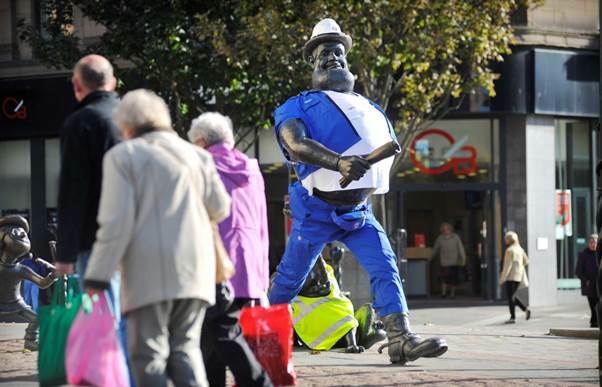 Take one of Dundee’s best known comic book characters Desperate Dan and turn him into a first aid volunteer for the day. Real PR set out with a measuring tape to fit out a civic statue of Dan as a first aider. Real PR prepared a photocall and press release about the launch of the new commercial operation in Dundee. We then hit the phones gauging interest, setting up interviews and talking to picture desks. We booked Maverick Photo Agency to cover the event for non-attending press and for St Andrew’s First Aid. Having already sought permission from Dundee City Council and modified the largest available St Andrew’s First Aid uniform to (just) fit the huge Desperate Dan statue, we arrived early on a Tuesday morning to get to work and brief St Andrew’s local commercial spokesperson Gaynor Daniels and a local volunteer Brian Fairweather. As well as a lot of attention from passersby, the idea of Dan as a first aid man caught the imagination of the local media. The stunt was covered across all of the city’s mainstream press. But Real PR didn’t stop there. We followed up with opinion and advice led pieces in the two highest circulating Dundee papers, The Evening Telegraph and Dundee Courier to build on the momentum of the Dan activity after the stunt. The story also featured on local business press including The Dundee and Angus Chamber of Commerce Website, Dundee.com and Third Force News. Search results for St Andrew’s First Aid increased from Dundee.